LA County Yarn Crawl next weekend. that needs to be in your stash. 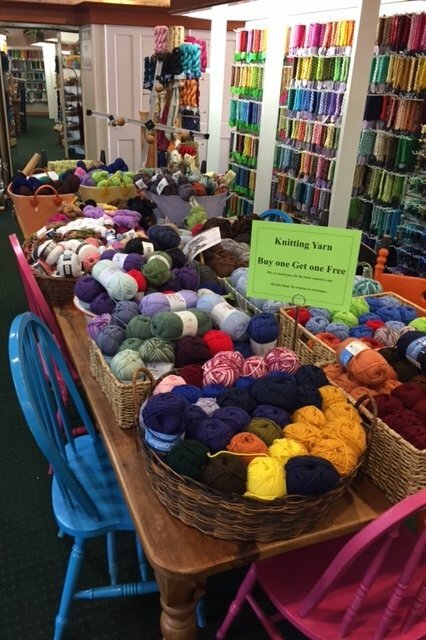 Buy One Skein and Get One Free starts today!!! For the Yarn Crawl we are moving the yarn into our Gift Shop area to make it easier to shop. We hope you will like the temporary set up. Lux Adorna and Trendsetter Ecotone are our featured yarns for the crawl. The Bonnie Bishoff Shawl Pin trunk show will also be here. Snacks, give aways and fun are all on tap for the weekend. Please note that Huntington Drive will be getting paved on Saturday, April 8. This means no parking in front of the store. You are welcome to park behind the shop. Go down the alley and look for balloons and an awning that says The Andover Shop. You are welcome to stack park or park in the lot to the East of our lot. DO NOT PARK IN THE LOT TO THE WEST OF US, THEY WILL TOW!!!!!! it would be best for you to come see us on Thursday, Friday or Sunday. Please don't let the mess on Huntington keep you from crawling with us.